My first hand knotted tie on necklace. I just bought the beads today. 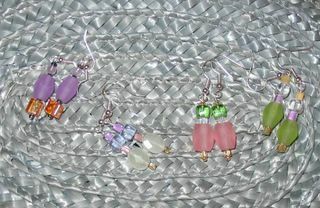 I call them "candy earrings", my newest creation this afternoon. 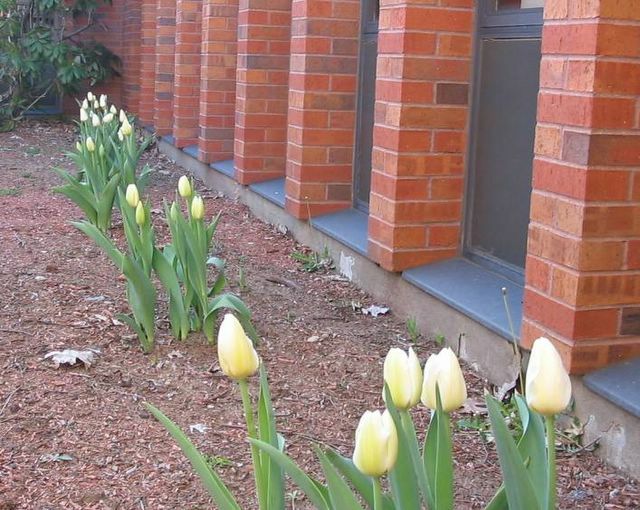 The new tulips are in bloom in our yard. It is still cold, so we haven't gotten the yard all cleaned up yet and ready for summer. 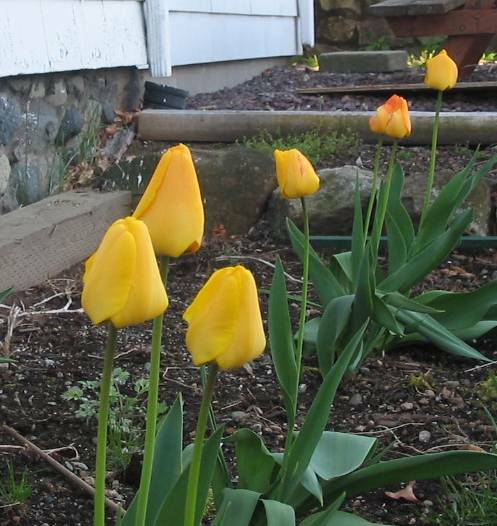 George and I buy tulips in the fall and plant new ones every year. We read the label and look closely at the pictures, but in the spring it is always a big surprise. These yellowish orange ones are high and healthy, and the white ones we planted at the church are also the big ones. 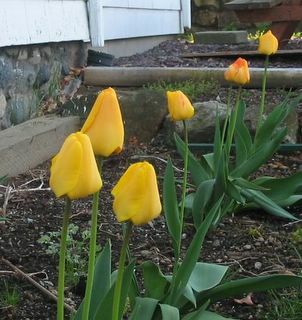 In the front of the house, we have smaller, more delicate tulips in red and yellow. We planted them one very cold night last fall, and we didn't make a big fuss about which ones went where, we just plunk them in. 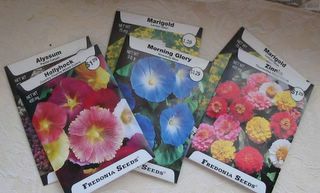 We will plant more for next year. I have friday afternoon off because I am going in for a special project on Saturday morning. 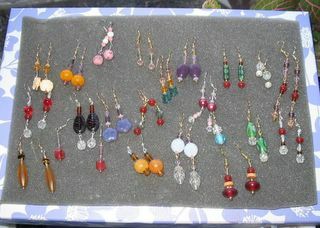 I really have to use the time to make more earrings today, because the open house studio is tomorrow afternoon. Each seller will get a half of a table, and be able to lay out their goods. I'm not expecting much in the way of sales, but it will be nice to meet other crafters and jewelry makers. I'm selling them for the low price of $12, so we will see. I had to run out of the house this morning and go to the Dunkin Donuts for the second time this week to buy doughnuts for a morning meeting. It doesn't seem fair. When I mentioned at my Weight Watcher meeting that I was the one who was assigned to bring the doughnuts, she said, "maybe you should get another job." I thought, 'maybe she doesn't know how hard good jobs are to get these days'. I don't mind getting the donuts, but I do have to concentrate and keep my mitts out of them. 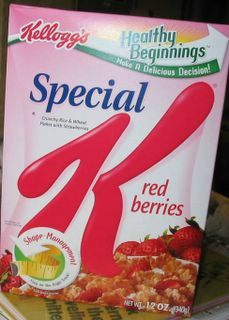 I had a nice bowl of Special K with strawberries this morning so I wouldn't be so tempted. George and I went for a walk around the park tonight and figured out that it would take four walks around the park to make two miles. Weight Watchers says you should walk 10,000 steps a day. George says that is five miles. I don't know how he knows that, but he's the engineer. I don't get anywhere near five miles in a day. I think only a car hop would walk that many miles on a work day. They sell pedometers at Weight Watchers, but I am not going to buy one. I already know that I could count my steps on my fingers. Well, maybe that is an exageration, but you get the idea. So today I will take my mile we did tonight, and this weekend I will try to work up to two miles and then, sometime later on, I will up it to three. My new Ipod should make the going more fun. Walking is the best exercise for me, and I always feel better when I get back. It is the "reframing" of the day to include the walk that is hard for me. 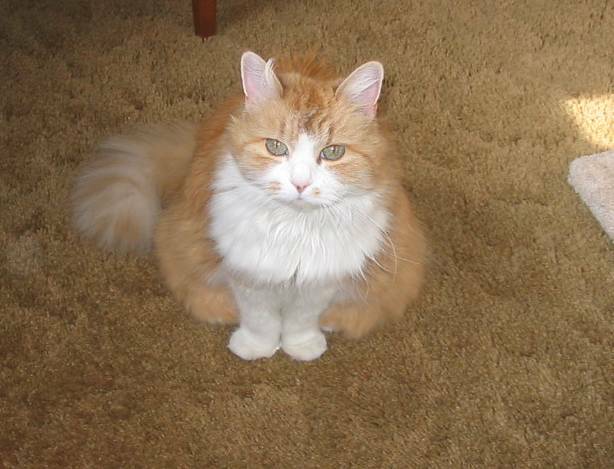 I have so many other things I like to do, like sit. I left the house in such a hurry this morning I completely forgot about blogging. I must have been concentrating really hard on the doughnuts. Wonder why. I had a great time at my class last night. There were four of us at the table and a very fun and sparkly young woman who was the teacher. 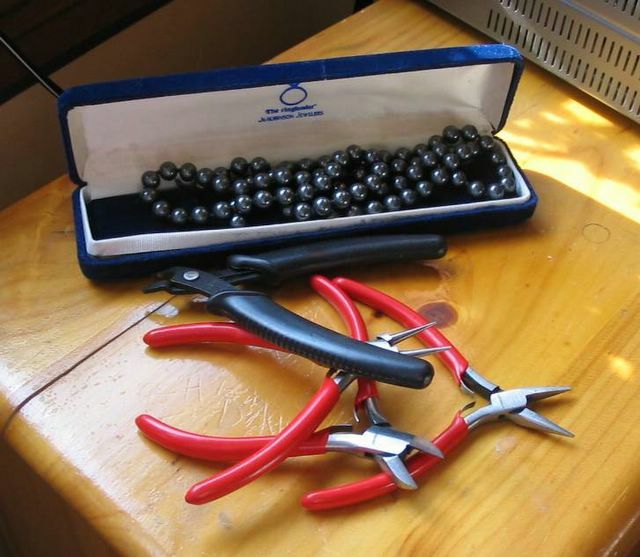 She had lots of experience, and wore a beautiful cuff of gray pearl beads that she had made herself. Everyone in the class seemed to have quite a lot of experience and two people left with a finished project. 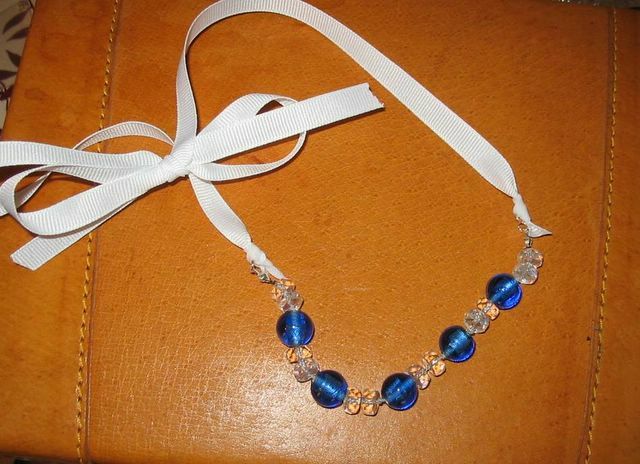 One young lady made a gray pearl necklace with an organza ribbon to tie it with. It was stunning. 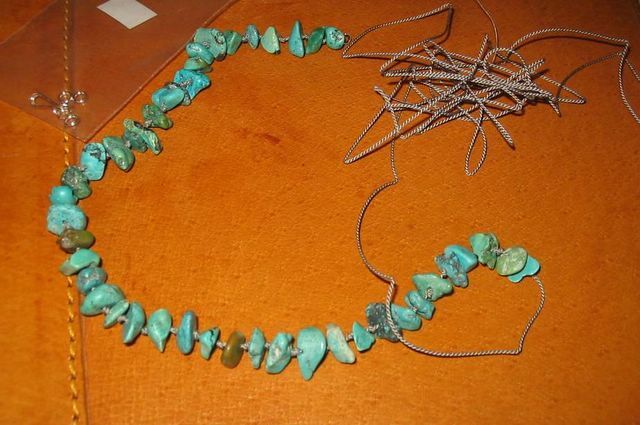 I decided not to use the black pearls because it would take too long to cut them off their existing string (never thought of that), so I used some turquoise that I've had for years that needed stringing. I called it my "rustic" necklace. Knotting is clumsy at first, but the the instructor taught us her trick of holding the tweezers down and pulling the knot and the bead together at the same time. She showed us how she sits with her legs crossed and uses her knee as a workspace. Several times I was so interested in the knot, that I forgot to pull the new bead down..and had to unknot and try again. Unknoting is hard to do, so you don't want to make that mistake often. I was the only one who ever did that particular mistake...but I managed in the end to get a nice start on a string of knotted beads. The knots are not as tight as they will be when I get more experience. The class lasted until 9:00, but I left at 8:00 becaus we were pretty much through with the instruction part and it was clear I would not leave with a finished project. It's nice to have a class and be able to go upstairs to buy whatever you need for the project. The instructor convinced me that red silk looks really "cool" with my dark gray beads, so I will try that. I can't wait to come home tonight to get started. This is what I learned to do tonight: knotting silk thread between beads. The class was fun, and even though I had my clumsy moments, I finally got the hang of it. Curious Thunder. Am I the only person who thinks she is a beautiful kitty? I especially love her feet when she stands like this. 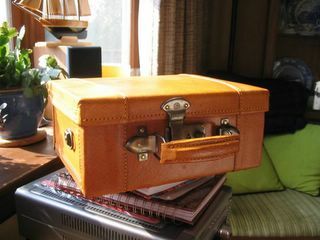 My leather case of jewelry tools---makes me feel like a little old watchmaker or something. I was able to come home early from work today, and it is a good thing, since it was a busy day and I have a jewelry class tonight. I need to rest up. The housecleaners were here in the morning, like invisible trolls who come in to make things nice and then leave. We hardly ever see them. The night before they come is still frantic--putting things away--but we survive and the next day the house is so clean and smells like furniture wax. I have a class in knotting for bead stringing. That sounds cumbersome, but you don't knot the beads, but the string, so that is the only way I can say it. I will buy the supplies I need when I get there, whatever that might be. This is my leather box of tools, and it is the first time it has ever left the house. 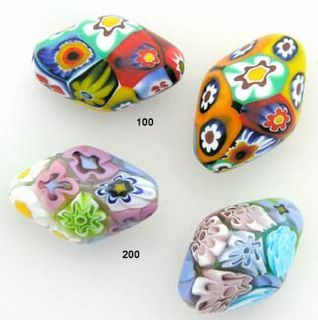 I am bringing along some beads that need restringing, but they may not be the right kind, so I may buy new beads there. The class is three hours and I'm sure it is going to be interesting. Kitty came over to see what all the commotion was about. Have a good evening. I'll make a full report on the class tomorrow. Special K with strawberries is my favorite cereal. "Favorite" for now, I switch back and forth. I recently went on a nutrition website that looks at all the calories, minerals, vitamins, etc. for all kinds of foods, and found that the high fiber cereal I was eating, and which I really didn't like much, is no healthier than a nice bowl of strawberry Special K. High fiber cereals, like Kashi, although healthy, most of the time are higher in calories. So, I'm back eating what I like. Speaking of that, George and I went to Fuddruckers and had a delicious hamburger for dinner last night. I was hungry all day, and about 5:00, I just decided not to fight it anymore, and go eat meat! It was delicious. I had the small burger with mushrooms and swiss cheese, and he had the three-cheese. I ate the whole darn thing. We topped them with salsa, onions, lettuce and tomatos. I even added a little mayonaise. No fries. Today I gained a pound. I'm not going to pay any attention...a girl's got to eat! I have three minutes before I have to leave the house and go to work, so this is going to be short. The weekend was full of re-organizing from winter stuff to spring stuff, and we made a trip to the storage unit and packed a few bins of winter things. The guest room is now for guests again. But I didn't make a single earring for next weekend's show. I just didn't have it in me. Creativity can't be scheduled I guess. Have a great Monday. I'm off to buy doughnuts--no, not for me---for a printing company I'm visiting this morning. A pretty picture I took at the church at sunset last night. 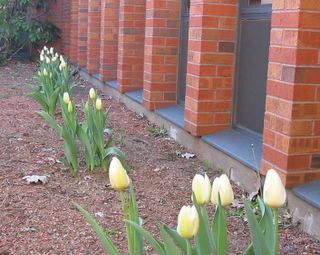 The tulips that George and I planted at the church last fall. I'm up early this morning, waiting for the rain to start. It is going to be rainy all weekend, and I have all kinds of projects lined up for myself. I am going to put away all the winter woolens and take them to the storage unit. Since I am a one person knitting machine, I have a lot of wooly things to put away. I pack them in lavender sachets, having learned long ago that mothballs are way too smelly. I have the guest room bed piled high with shawls, scarves, and sweaters, and all that has to be moved because we are having company next weekend. It was a long winter and I'm looking forward to putting these things away and getting out the flipflops and the straw bags. We are going to go see the movie The Interpreter today. I'm not really sure it is going to be that good, but we are anxious to have some popcorn and sit down to a movie and there hasn't been anything around worth going to for a long time. Not since "Shultze Gets The Blues" anyway. I'm probably only one of a hundred people who really loved that movie. The trees and flowers need the rain, and I don't mind a rainy weekend once in awhile so you can snuggle in and get some things done. 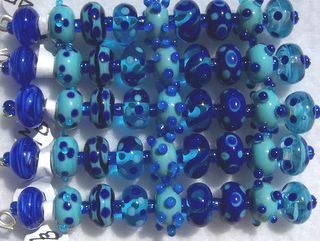 I have beads in candy colors to make earrings, and I'm looking forward to some time at the dining room table to do that. Next weekend is the open stuio when I will sell my earrings and scarves and I need to get ready. There's also a big sale at Macy's today and I'm going shopping for a Mothers Day present to take to Oklahoma with me in two weeks. This is what the all the excitement is about. Today I went to the dentist office before work to pick up the bleaching kit for my teeth. Another day, another $200--and that is half price--because of the veneers I have scheduled. The dentist said if I really want to do myself a favor, I would not drink coffee, because that, and red wine, stains the teeth worse than anything. I'm sure that's true. Maybe there is a way to drink coffee through a straw. Just kidding. I will wear these new molds in my mouth for an hour at a time. You inject the bleach solution into the mold and pop them in. You can do it more than one hour a day, but the solution only works for one hour so you have to clean it out and start over. I'm not sure what the final result will be, but the proceedure is a lot different than I thought bleaching would be. I thought you went to the dentist and he bleached your teeth and charged you $300. Turns out it costs more than that, and you basically do it yourself. Oh well. I'm glad it's Friday. Today is another lovely crisp sunny day, but the weekend forecast is for rain and wind and they mean it. George and I will be going to an auction to benefit a local charity on Saturday, and I am communion assistant at church on Sunday. I will be making earrings this weekend, and also making the "backs", the cards that the earrings will be sold on. I have some groovy paper and my glue gun, and away I go. I'm going to price them to sell, probably $10, since I really just want to move these on out and work on more. The Zen is in the creation, not in the selling. Have a great day y'all. Have an extra cup of coffee for me. 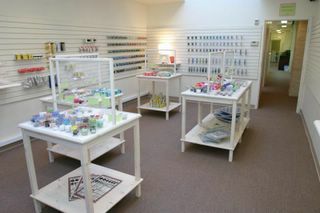 I continue to be very excited about the new craft studio in my office building. I have signed up for a class next Tuesday in "Knotting for Beaded Jewelry" and another class in May in "Crocheting with wire for jewelry". I have a broken string of rather valuable Venetian glass beads that was given to me a long time ago, and I have some antique pearls and bead hand-me-downs, and making them into beautiful new necklaces on good silk string is exciting. Crocheted jewelry is new, and the samples they showed are really nice. Sparks sends me all kinds of annnouncements about new classes that are taking place every night. Their calendar is full of classes that I want to take; chandelier earrings, beaded necklaces, crocheting with wire, basic quilting--the list goes on and on. 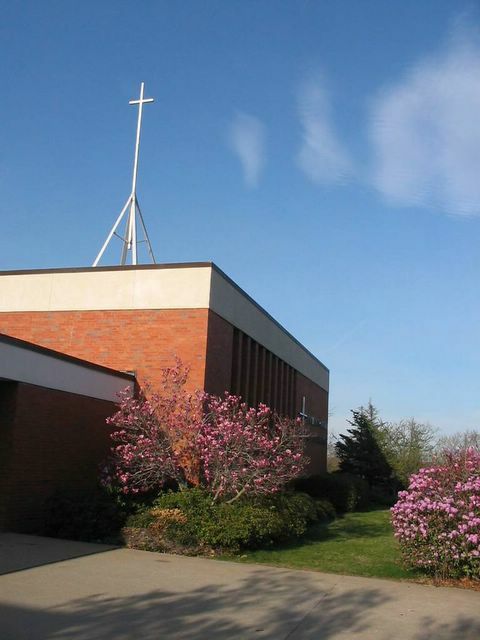 The church bell choir is going to perform for the last time the weekend I am in Oklahoma--Mother's Day--so I do not have to go to rehearsals on Wednesday nights any more. The bell choir is off for the summer after that final performance. That leaves Wednesday's free to take more crafting classes if I want to! Peonies are my favorite flower. The new earrings that I will sell at Sparks on April 30th. Today the forecast is for 88 degrees! That's too hot! Oh well, spring always seems to bring some surprises. This picture is my earrings which I will put onto pretty cards and sell at the craft studio next weekend, April 30th and May 1st. 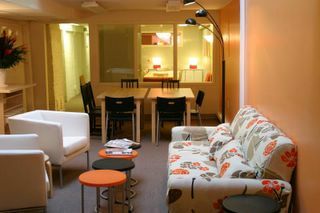 The new studio will be featured on a local show called Chronicle tonight. I stopped in yesterday and they said they have received hundreds of emails asking about it. I think they are going to be a huge success--which is a good thing indeed. Yesterday George and I went out at lunchtime to a church in Newton to pick up a donation of silverware for the shelter, and I'm really glad I asked him along. We wound around the tightly packed streets near the Pike, and I would have been one lost duck had he not come with me. After that I had a long dentist appointment, and have made plans to add veneers to some of my teeth to "accentuate" my smile. I also am going to be bleaching for the next two weeks. Amazing what technology allows us to do now. Actually, having that done has been something the dentist and I have wanted to do for awhile, but right now, my insurance will pay for most of it--so away we go. By the end of June, I will have perfect and perfectly white teeth. It's a big step, but...if not now, when? It is Spring vacation week here, so the traffic is light, and about half of the people at my weight watcher meeting last night were missing. My weight stayed the same last week, with all the food surrounding the progressive dinner and the delicious leftovers and the dessert party, etc., and I have to stay out of those delicious oatmeal cookies that George made. 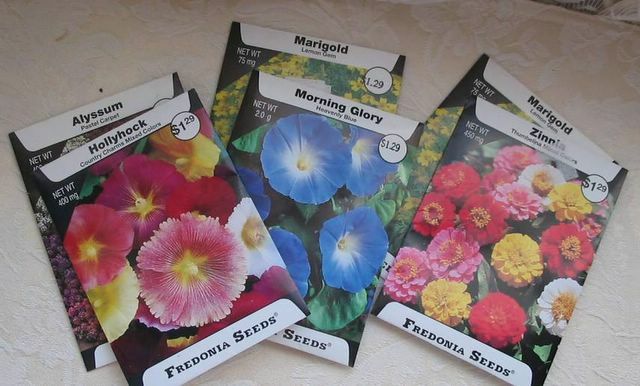 [I gave the last of them away to my friend at work this morning.] I'm already way down on the scale today...the day after the weigh-in, of course, wouldn't you know. This week I'm really going to eat small and light, and march on to my goal. Another day another salad. On Saturday and Sunday, I have been invited by Sparks, the new crafting club that I joined, to sell my earrings and display my "crafts", at the Somerville Open Studio. For two days, from noon until 6 p.m., about 20 stores and gallerys will be open and displaying art work and crafts from local artists and crafters. I'm jumping at the chance to sell some of my earrings, and while I'm there, I might as well show some of my scarves that I made last year and see if there are any buyers for those as well. I'm also bringing the granny square afghan that I finished last summer for display. Maybe it will inspire someone else to make one, who knows. 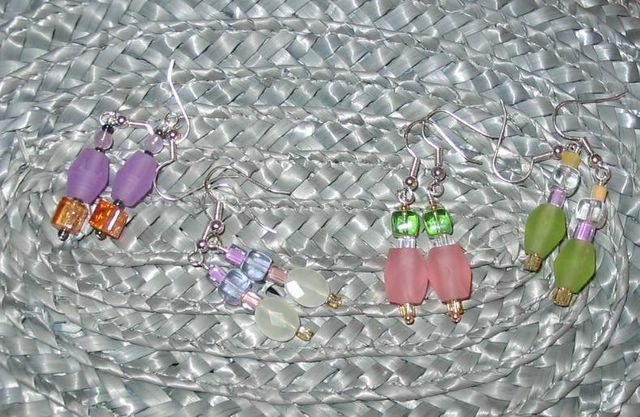 My plan is to price the earrings at a very affordable price, and not to hope for too much. I will take a project and work there while I talk with people. On Saturday evening there is an auction for a local charity that George and I often attend, and several times we have found treasures that we couldn't live without. Can you tell that I haven't gone to work yet this week and I'm already looking forward to the weekend? Today I am going to make the display for the earrings, and I'm looking forward to sharing them with others---since I have WAY more earrings than I could ever use. 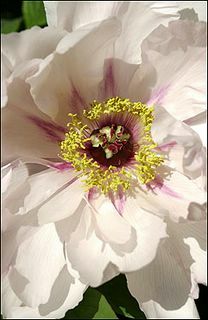 The name of my "company" is Wildflower Designs. Wish me luck. See you tomorrow, have a great day. 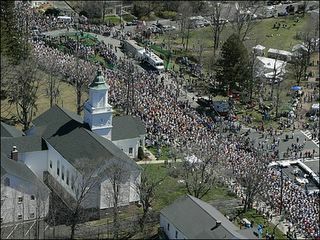 The start of the Boston Marathon today. It's Patriots Day here in Boston, and almost everybody has the day off. When I first moved here, I thought it was great that we get a day off when the rest of the world has to go to work. 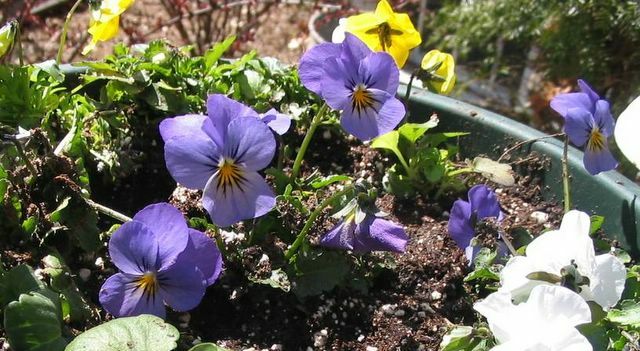 And the day falls in the beginning of Spring, when the flowers and leaves are just starting to come out, and when everyone needs a break from the winter doldrums. It was a long winter, and it is great to see the green grass and the leaves budding on the trees. Spring is here--at last! We are so much later than the rest of the country. 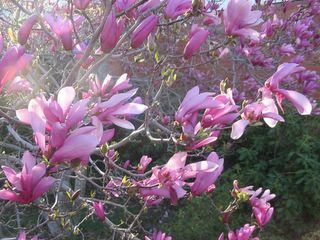 Oklahoma, where mom is, has had flowers blooming for two months already. 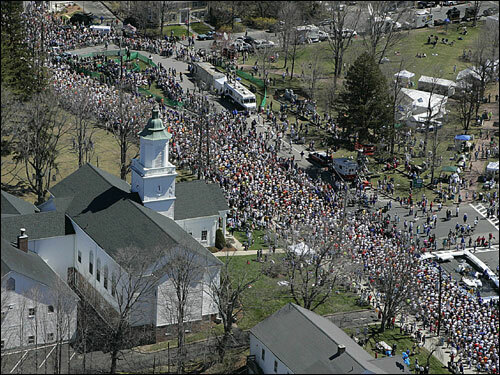 George and I went to a ballgame once on Patriots Day, watching the marathoners go by as we walked to Fenway. Today George goes to work, because his clients do not have the day off. I am going to meet a friend for lunch, put away winter clothes, and just enjoy the day off. The weather this week is going to go as high as 83...and we have opened the windows in the house for the first time since winter. Thunder enjoys sitting in the open window surveying the back yard and watching birds. Pansies at the front door. We had six people come for our part of the church progressive dinner last night. Everyone showed up exactly on time at 7:00. We had all gone to another house for the hors'doeurves. My concern was how to bring all parts of the meal to the table hot and ready to eat at the same time. I didn't want to overcook the vegetables. This is the menu: rolled salmon steaks, brushed with a mixture of soy sauce and maple syrup, and baked in the oven; boneless chicken breasts, (for people who didn't want fish-which was only one), coated with seasoned bread crumbs and baked; wild and pecan flavored brown rice, mixed with toasted pecans and dried cranberries; julienne carrots; and fresh broccoli in butter. In the afternoon, I prepared the vegetables, cooking them until they were tender, but still very crisp, and putting them in an ice water bath to stop the cooking, then layering them in a casserole with a few dollops of butter. After the guests arrived, I put the glazed salmon steaks in the oven and took out the chicken breasts, which had finished baking, and put the rice casserole and the vegetables in the oven to warm up. Lo and behold! Everything came out just right, all at the same time, delicious and crisp, not overcooked and soggy, and we were all enjoying our dinner about 10 minutes after the guests arrived. It went like clockwork. George and I are still talking about our success...how good the salmon was, etc. After church today someone said, "oh, are you the one that made the salmon?" I guess we are famous. We all had a great time. We even went to the dessert course at another house about 15 minutes away, and enjoyed strawberries and whipped cream, and there were many cakes and desserts that I didn't even taste. We hurried home to do the dishes--my Noritake china can't go in the dishwasher--and fell into bed...happy and relieved. Have a great Sunday. I'm going to take a nap. 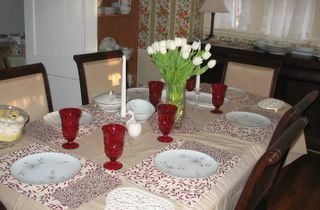 Diningroom table almost set for the dinner party. Tonight is a church progressive dinner, where people start at one house for appetizers, then move on to another home for dinner, and then on to a third house where the whole group finally congregates for dessert. 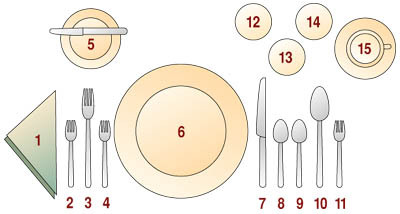 We are hosting one of the dinners. I need to give more dinner parties, to get into practice. We are having salmon steaks marinated with soy and maple syrup, tarragon chicken breasts (one of our guests does not eat fish), wild rice with pecans and dried cranberries, steamed broccoli, juilienned carrots and a guest is bringing a salad. The meal sounds simple to make and the only trick will be to leave our house to go to the appetizer course and then rush back here to put the salmon in the oven and have it ready by the time the guests arrive. I will make the veggies and the rice ahead of time, and just reheat them a little in the oven. I also bought snowflake bakery rolls which I will serve with real butter. Sounds good to me. George is going to make chocolate chip cookies today, and we have ice cream, just in case folks want to stay here and not leave for the next place. I'm not sure if we will go or not. There is church tomorrow, and I'm playing in the bells, so I want to feel good and be sharp in the morning. A full day of preparations here. Like I said, I need to do this more often! I can't help but send along another picture of the most prolific orchid I have ever seen. 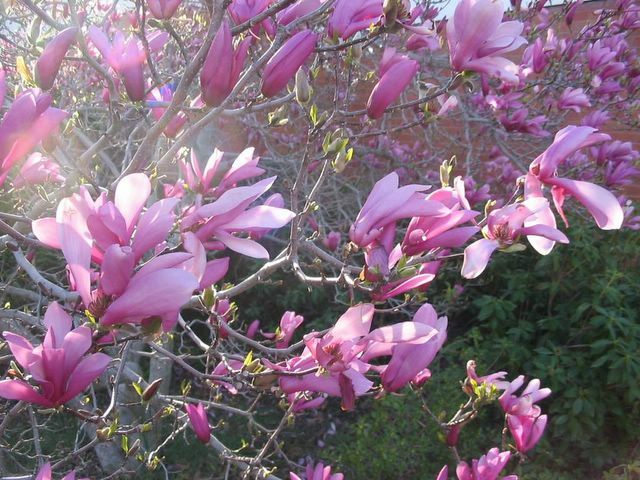 It is chock full of blooms. It is hard to get a good picture of it because it is so spread out. It flourishes in the den window right behind my computer. 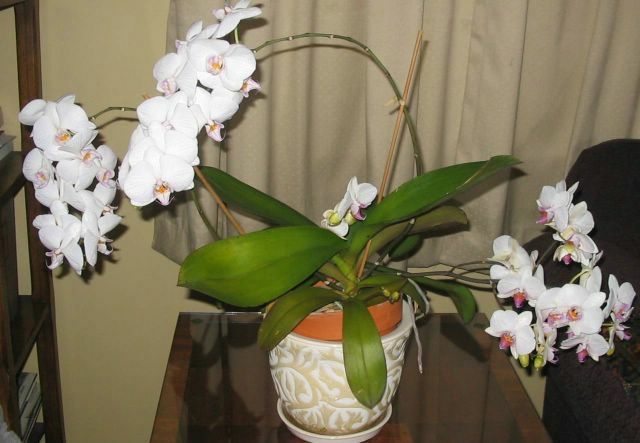 Another good thing about orchids is that cats do not like to eat them. Bad kitty sometimes chews plants. I heard recently that Easter lilies are especially poisonous to cats and only a little bit of the leaf can make them very sick. Abundant sunshine predicted for the next two days. Today is a full work day for me, or to say it another way, a day full of work. And tomorrow I get ready for the dinner party at our house. We're on the short slide to the weekend. Have a good one. The HUGE bag of chocolate chips! Relaxing with Pastor Keith after dinner. Finished lasagna ready for the oven. One's bed can never be too soft or too wooly. Cajun music makes me heart soar.